As the Black Rebel Motorcycle Club plays in the background, allow to me rummage through my scattered baseball thoughts as Christmas stands just three days away. With spring training less than two months way, the smell of a new baseball season is coming closer and closer to the nostrils. Confessional time/opening. Look, there is nothing wrong with football and hockey but baseball owns a certain piece of my soul. When spring comes around and fake baseball begins, the blood flows faster, the heart beats at the tune of a Rolling Stone classic and the mood hops on a swing. It’s a time of the year that I rely on and also remain afraid of. It’s like being a character on HBO’s Game of Thrones and staring down a distant white wall of terror, knowing doom is on its way. Baseball is doom. Sure, the Cards could win it all in the end but over a month of exhibition games followed by 162 official games with playoffs following, there is no way to know the end. I don’t care if you know three genius stat addicts and have a friendship with a future reader and a relationship with a palm reader. Baseball season claims no clues. A fan or writer must sit and wait for the action to unfold. Is John Mozeliak done dealing and adding? Yes and no. He has added a rightfielder in Jason Heyward who is only 25 years old and could play himself into a lifetime in St. Louis if he relocates his power stroke and plays up to his reputation in the outfield. He has added Jordan Waldon and Matt Belishe to a bullpen that lost Jason Motte. 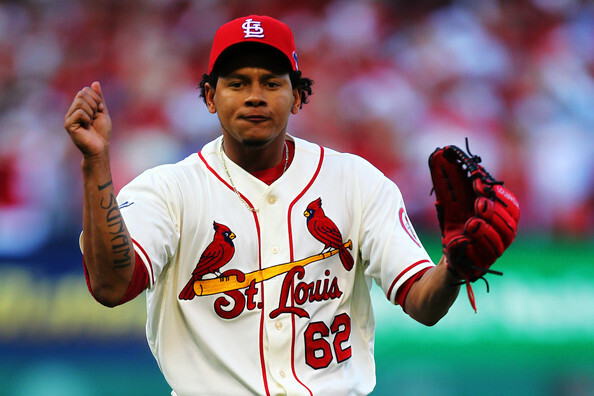 Shelby Miller is gone but Carlos Martinez gets to play with his fastball, changeup and slider in an expanded role. Mo added Mark Reynolds and his HR pop to a bench that has been weak and gave the team insurance behind Matt Adams at first base. If the season started tomorrow, the Cards could run something like this out there. Matt Carpenter, Jon Jay, Matt Holliday, Matt Adams, Jhonny Peralta, Jason Heyward, Yadier Molina, Kolten Wong, Adam Wainwright. There are other players that could be added but how many outsiders do you want to clog the roster with when you have hungry young talent on the farm like Randal Grichuk, Stephen Piscotty, Xavier Scruggs and Tommy Pham? Asdrubal Cabrera is out there but will cost you 10 million dollars to hunt for starts between shortstop and second base, where you have a guy at short in Jhonny who will make 15 million in 2015 and a young phenom in Wong who needs playing time to get right. A starter could be added but that means the trade for John Lackey‘s cheap yet productive 500,000 salary gets pushed and Martinez gets misused again in 2015. The bullpen is stocked. The bench looks better with Reynolds, Grichuk. Piscotty and possibly other young guns. A backup catcher is the only spot that Mozeliak could really add to but where are you going to find a guy who knows he will only play once a week unless Yadier gets hurt. Where are those free agents located at? Here’s you check, but head to the bullpen and warm up the starter so Yadi can get fully geared up. It isn’t happening. Molina will eventually play more first base but he isn’t exactly Mike Piazza or Joe Mauer just yet. He is still a gold glove catcher who means way too much behind the plate to move right now. The Cubs made moves, but Theo Epstein had held his cards for a couple seasons. He is bringing a corpse back to life up north and needed to reestablish something. His moves don’t scare me. The Pirates will be a threat, and it doesn’t matter who they won the rights for today. The Brewers don’t have enough pitching and their lineup can’t hold up over 162. The Reds have a ton of problems on the offensive side but have a few shiny pieces. One can slice this cake any way they want and still paint the Cardinals as the front runners to take the division. Threats always exist but the Cubs can’t just create a winning playoff bound team in one offseason. The Pirates have tried to topple the Cards twice and fallen behind. There are still moves to be made before the season and at the deadline, but right now I still see the Cards as the front runner. The team to chase. The squad with the biggest scent for other wolves to run after. It’s not rocket science or unknown circumstance. It’s just the way the NL Central is made up these days. Mo can make a few other moves if he wants but looking at the team today, I see a fierce competitor. The forecast for runs scored isn’t a sealed deal but the pitching is stronger, younger and the bench is improved. The young talent gets a closer examination in 2015. The rotation has three legit 200 inning candidates in Wainwright, Lackey and Lance Lynn in 2015. There are reinforcements waiting in the wings. I could be wrong. It could be the usual blindness of offseason ramblings hitting me right now down in Little Rock, Arkansas. This time of the year always leaves a baseball guy feeling needy. Instead of wishing for another redbird present on Thursday, just enjoy the snow and the family. Baseball will be here before you know it and it will consume you. What are your thoughts, worries and needs when the 2015 St. Louis Cardinals come to mind? Leave a comment below or find us on Twitter or on Facebook.